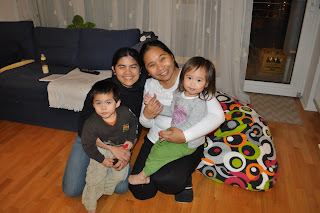 I came to know a fellow Bisaya blogger who lives in Munich here in the blogosphere a few months back. We have a mutual friend, one who I know in College and who is her childhood friend since they come from the same province. Her name is Joe-ann of My Life and when she left me a message in my Shout Box that they will be in Stuttgart for the weekend, I immediately arranged to meet her and her family on Sunday after hearing mass. We met in Schlossplatz where the Christmas Market is and it was like meeting an old friend. We learned a lot from each other and we exchanged notes on motherhood. Her hubby and Hanhan were getting along pretty well too. You know how it is when you meet a fellow Filipino, a kababayan at that (one who speaks the same dialect as you), there will always be lots to talk about. And since it was getting cold, we decided to invite them over for dinner at home. Our little ones got a chance to warm up to each other and play at home. Seeing them play with each other was just a happy and beautiful sight. Before they left, we exchanged YM ids and FB names so that we can keep in touch. I recently learned through FB that Joe-ann's hubby is the brother of another friend in high school. Such a small world indeed!